As I posted before, I finished my previous job with MicroWarehouse before Christmas. On January 3rd, I joined Innofactor. Innofactor is an IT consulting and services company that operates in the Nordic countries: Finland (HQ), Denmark, Sweden, and Norway. If you attend conferences or user groups, then there’s a good chance you’ve seen some of their employees speaking; Innofactor has a number of MVPs on their books including (but not limited to) Damian Flynn (also Irish), Olav Tvedt, Alexander Rodland, and Stefan Shorling. Quite simply, Innofactor is the A-Game in the Nordic countries, if not Europe. I’ve known of Innofactor for quite a while. Lumagate was the company I knew first, but they were acquired by the Finnish company in 2016. My first contact with Lumagate was through Kristian Nese, now a part of AzureCAT in Microsoft. Kristian was the technical reviewer of Private Cloud Computing which I co-wrote (I did a tiny part) with other MVPs, including Damian Flynn. Damian joined Innofactor a few years ago – I’ve known Damian since he first became a Hyper-V MVP many moons ago. More often than not, we are roommates at the MVP summit. I got to know Olav through bringing him to Ireland to run EMS training for MicroWarehouse’s customers. It’s through these connections, and eventually meeting some of the other MVPs that I got to know what Innofactor is and wants to do. My title is Principal Consultant, but I’m doing more than just project work. I don’t want to discuss that publicly yet … it’s a strategic thing 🙂 I’ll say this: the project work I have done so far has been quite cool, and the other thing I’m doing gives me an opportunity to work with great people across the Nordic countries. I’ve had a lot of meetings in my first 7 working days and we’ve figured out a lot of stuff that I thought might have taken weeks or months. I am not moving to Norway. In fact, I spent a few days over the Christmas holidays working on my home office. It’s not finished yet – I want to put in a new desk and do a little bit more painting, but it’s getting there. 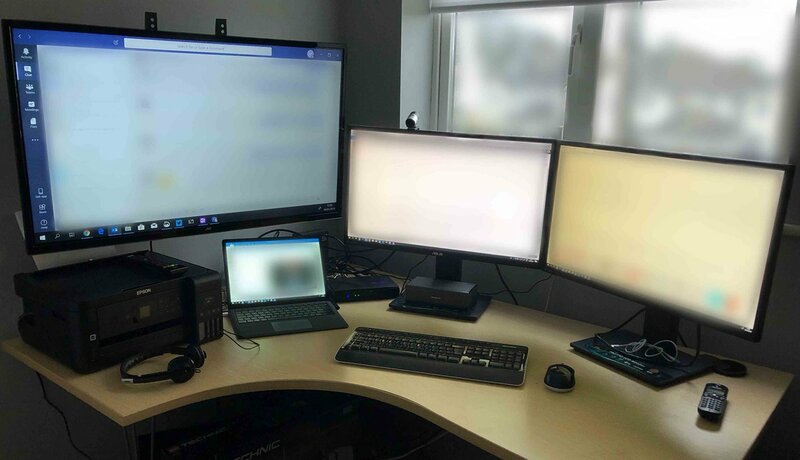 Yes; I am working from home – the commute is wicked tough 😉 Almost all of my communications and collaboration is done through Microsoft Teams, something one of the directors pushed out before I joined. I was skeptical at first but it works well. And because the work we do is in The Cloud, we can do it from anywhere. I said Innofactor was the A-Game. If you’ve seen any of the consultants present, then you know what I’m talking about. The conversations that I’m having on a daily basis are all state-of-the-art. What lies ahead of me will be both challenging and amazing. I have worked for American, German and Irish companies, including corporates, finance, and startup/small/medium businesses. My last employed, MicroWarehouse, was very flexible – the MD is very supportive of staff and deals with family issues in a thoughtful manner. But I have never experienced anything like working for a Norwegian company – maybe it’s an Innofactor thing, maybe it’s a Nordic or Scandinavian thing, I don’t know. But they take life-work (notice the order) balance very seriously. There is work, but most of your time is life. Don’t get me wrong, work has to be done and it has to be done well, but there is no doubt in your communications that no one is expecting 18 hour days. Working from home has huge advantages, especially when you combine it with flexitime. I start work at 8 am most days, earlier on Fridays, and I’m able to finish earlier. I have more time at home with my family, I am here in case something needs to be delivered or done at the house (very useful last week when a new heating furnace was required in an emergency), and I can use my flexitime to deal with things for the kids like dental appointments, sports, or events. It really is life changing. A hard part of working from home is being disciplined. It is so easy to say “I’ll work in the sitting room and stick on the TV for background noise”. Next thing you know, you’re binge-watching Netflix! I’ve heard home workers offer all kinds of solutions. Some get dressed for work, get in their car, drive around the block and then start work in their home! I think the most important thing to do is to create a workplace. The small (box) room in our house was set up as an office when we moved in. It required some work over the holidays, but I tidied it up and got it ship-shape for the new job. This is where I work – nowhere else. When I come in here, the door shuts behind me and I am in work mode. I even use a “work laptop”, not my personal PC. That virtual line puts me in work mode. And it works – after 7 working days, today was actually the first time I’ve ever logged into Facebook on this machine. Congrats and good luck Aidan! This is a huge win for Innofactor! They definitely made a great team, even a lot better now! Congrats Aidan. Working for end customers will be open whole new doors for you. Your years of experience will be really valuable for those customers. Well worth investment by Innofactor team. 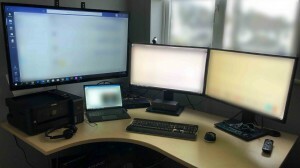 It’s funny, but I forget this is different from the “normal” workspace that is in the majority. Our company didn’t have an office for the first 9 years. We aren’t that big (~20ppl) but working from home/remote is standard for us. We only started getting an office when we found out we don’t see each other enough: So we have a mandatory one-day office day where we do the “coffee-machine-talks”. It’s very beneficial, as you learn all kinds of stuff where you normally wouldn’t talk about when working remote. It also gives you the feeling that you have done nothing compared to the days working at home, although it’s really useful. We also see ppl coming into the office because they prefer it than working at home. The younger ppl with less experience don’t want to work at home at all, i think they prefer to be around the more experienced ppl. The seniors only want to work from home, so that’s exactly the opposite and I think it has to do with them being disturbed less. Although skype/slack/email/phone doesn’t help with that. Discipline was never an issue, you cna tell if ppl don’t “deliver”, you can tell on their output easily. It’s actually worse on the life side of things, i’ve had ppl who did evething throughout the working day, with ending up wokring from 9-12, 14-17, 20-22 which gave them the idea they worked all day. One word of caution though, I would recommend working 1 or 2 days in a community kind of thing like seats2meet (in the NL) or working at a friends office to keep you from being to isolated. It helped me to “disconnect” from work things, the 15-30m commute helped me to “close the door” on things and switch to family life. Also, because our working time are very flexible, we have our planning/availability in outlook in combination with skype/slack. We check there first before making a call as we don’t want to interrupt ppl if they are off work. this requires some discipline on the ther workers though, that might be the hardest from working like this. Slack is very well suited for this actually, we have phone availability connected to skype/slack as well: If you have your laptop connected, you are available, if not your aren’t. I had even a discussion with a helpdesk manager (30 ppl) and he couldn’t believe it could be done with his department, but I believe there is nothing keeping him from it, and further in the discussion it came down to him not trusting ppl. Which is the worst, because it has nothing to do with coming in to the office or not. I still see lots of companies sticking to the old ways for all the wrong reasons, so I’m happy you shared this. So, thats my pov on this.